Welcome to Moo Money – a refreshingly easy fundraiser that can raise tons of funds for your school, community group, or non-profit organization. It’s easy. Just drink milk, collect the lids, and get Moo Money! Think new computers, office supplies, or scholarships… the possibilities are endless! 1. Register your school or organization. We’ll send you a Moo Money Program Kit with everything you need to get started. For every 500 lids collected, your school or group will get $25 to use however you want. That’s 5¢ for each lid! products. And for Moo Money, you can choose any of these in any size. Only Turkey Hill Dairy products sold at Turkey Hill Minit Markets apply. The lids must be specially marked with a Turkey Hill Moo Money sticker. Turkey Hill Moo Money is open to any public, private, or parochial school and any non-profit organization in Pennsylvania. Each group within a school or each community organization is limited to one enrollment. Turkey Hill Moo Money program participants will receive 5¢ for each milk lid they redeem from specially marked milk purchased from any Turkey Hill Minit Market. Only specially marked milk lids that feature the Moo Money symbol will be accepted and eligible for redemption. The entire milk lid with the official Moo Money sticker adhered must be turned in to receive proper credit. Participants may submit their collected milk lids from specially marked milk purchases at any time during the course of the program. There is a minimum redemption of 500 lids per submission. All submissions are subject to verification. Checks will be made payable only to the enrolled school or organization. Payments will be made in $25 increments within four to six weeks of receiving the lids. 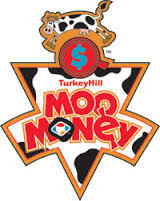 Each participating school or organization must designate a Turkey Hill Moo Money Program Coordinator. The program coordinator will serve as the liaison between the school or organization and Turkey Hill Minit Markets, Turkey Hill Dairy, and/or its designees. All checks, support materials, and communications will be sent directly to the attention of the program coordinator at the address/phone/e-mail he or she provided at enrollment. Designating a program coordinator and establishing a single point of contact will ensure that all materials and communication can be delivered in the most effective manner for both parties. Only milk lids with the official Turkey Hill Moo Money symbol submitted as outlined in the Redemption Procedures section of these rules qualify for redemption. Turkey Hill reserves the right to verify all submissions. Turkey Hill Minit Markets and Turkey Hill Dairy reserve the right to alter the terms of the Turkey Hill Moo Money program and to end the program at any time.